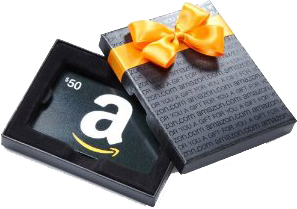 Thoughts Incorporated is proud to host monthly Amazon.com GIFTCARD writing contests! These contests may require certain formats or topics, varying each month. Previous contests have consisted of everything from greeting card to slogan contests, so all members have a chance to show off their own unique writing styles! Current contests can be found in our writing forum. We pick one creative writing category from our many forums then start a new contest forum. The writing category and dates of a contest are included in the forum description. These contests are “masked”-meaning the identity of who writes the entry and the identities of all who comment under the entry are hidden until the contest ends. Once the winners are announced all identities are unveiled for all to see. Here’s where things get interesting…. A contest runs for 10 days, and afterwards we open a poll in the current contest forum. The poll runs for 7 days for everyone (our members) to VOTE for a winner!! The top 3 rated writings are then judged by three judges of our choice. They vote and decide 1st, 2nd, and 3rd place of the highest 3 rated writings. After the winners have been determined, they are sent a private message that contains the Amazon girftcard numbers on our site and via email (email member used to sign up for the site). We verify all giftcards to ensure they are in working order before we send them to the winners. *Prize amounts do occasionally vary, but those listed above are the usual prize amounts.